I have a '92 K75RT with the original electric windscreen. At one occasion i had a piece of tape on the inside of the windscreen. When i pulled of the tape a very thin clear folio came with the tape of. Since the screen is very scratched i was surprised that the area where the folio came of, was clearer and without scratches - look at photo to se the clear area on the left where the tape (and the folio) was pulled of. Does anybody know the purpose of this folio? Does it harm the screen if i remove the folio and thus the scratches on the rest of the inside area of the windscreen? if removed the windscreen would be more easily scratched. Well it never worked then. Might as well remove it if it doesn't work. One thing I noticed on my 90 K75RT was that something (I assume a factory coating of some sort) would cause rainbows if I was wearing polarized sunglasses while riding. Maybe getting rid of that coating would reduce/eliminate that. My solution was not to wear polarized sunglasses though. I've heard that moderate to light scratching on windscreens can be reduced using toothpaste since some brands contain a mild abrasive. This probably would remove/damage any factory coating though. The screen on my K1100LT was getting very bad and I was considering replacing it when I found that the coating was the problem as it had deteriorated and that I could remove it using my fingernail. Progress was slow when I saw that the place where a sticker had been was free of this coating. I covered the screen in packing tape then peeled it off removing the crumbling coating which left an almost new looking screen that was perfectly clear and easier to clean. The coating may have prevented scratching when new but it sure got to be a PITA when aging. 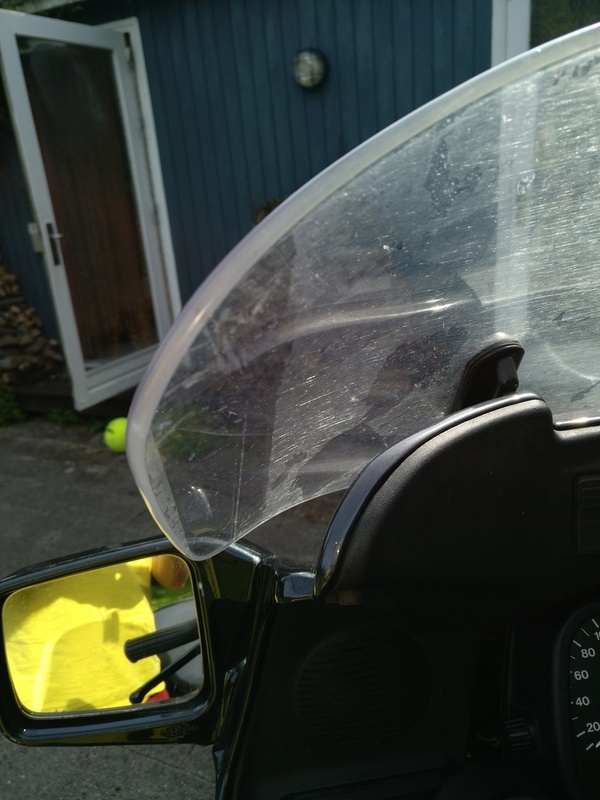 I have been reading a bit abount windscreen since I postet my question. As I understand it the windscreen is made from polycarbonate aka Plexiglas. This material oxidizes and becomes more and more nontransparent. Polycarbonate needs a clear layer of lacquer to prevent oxidation. It is the same with the "glas" in front of headlights of cars. There are several lacquer products. But buying a new windscreen after 27 years of use is not so bad. Hardly worth the effort of trying to polish out the scratches. @duck wrote: One thing I noticed on my 90 K75RT was that something (I assume a factory coating of some sort) would cause rainbows if I was wearing polarized sunglasses while riding.